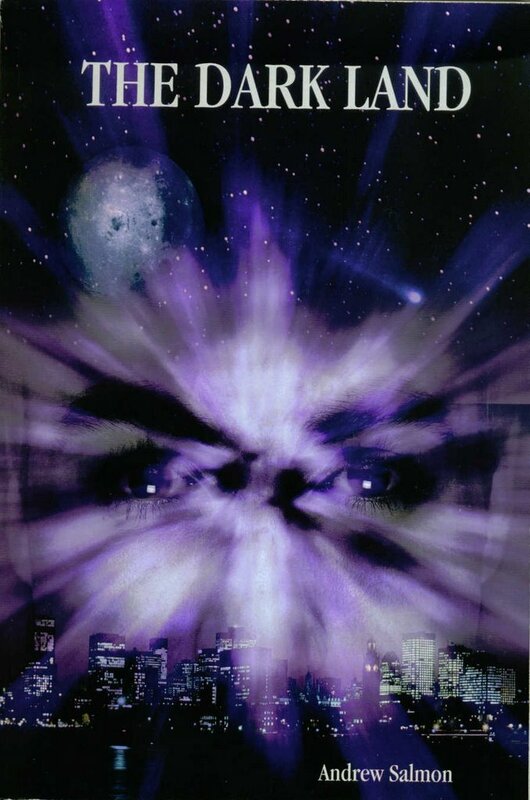 This is a straight out science fiction detective thriller that fires on all cylinders. In the not too distant future, the world has been ravaged by a series of natural disasters that have decimated the population. To help rebuild societies around the globe, mankind has taken to producing clones. But not just any clones, rather those created from the DNA of dedicated police officers and fire fighters. The idea here is to produce, from old stock, a new cadre of selfless guardians to protect the fragile remains of humanity. Into this world comes clone, Peter Reilly, grown from the cells of a much decorated Vancouver detective. Once out of the vats, C-Peter Reilly, the prefix obviously designating his artificial origins, soon learns that something has gone terribly awry in his maturation. Clones are grown with the memories of past lives erased so that they don’t have carry around baggage of lost tragedies. Minus these emotional hang-ups, they can enter this new world with a clean slate. But something is wrong with Reilly. He has memories of his first life, of his wife and children and the world before the devastation. Such information is considered taboo amongst the governing councils responsible for cloning and should his secret be discovered, he would instantly be mind-wiped. Reilly must keep the fact of his memories to himself, at the same time attempt to cope both mentally and physically with his “second” life. Salmon’s writing reminded me a great deal of the late Robert Heinlein. He approached classic science-fiction with a new perspective grounded in believable characters so that the reader is never overwhelmed by the strange new worlds the tale unfolds in. Rather C-Peter Reilly is so fully realized, he draws us in to his frightening and exhilarating life. How he copes with his loneliness, anger and ultimate resolve is the true core of the book. If I’ve any real criticism, it is the fact that THE DARK LAND is the first in a proposed series, and too much time is spent on the existing social make up of this post-holocaust environment. I would have preferred more action and focus on the actual murder mystery Reilly is assigned to solve. It seems to take a back stage chair until the climax where it is wrapped up much too quickly. Hopefully future chapters will even the action pacing with the exposition. All in all and solid thriller that should sought out. Salmon has a bright future ahead of him. Jack Stone is a sixty year old, divorced Hollywood screen writer trying to stop his life from simply falling apart. He travels to England with the thought of losing himself in some backwater village, away from the confusion that has become his life. Finding solitude, he hopes, will rekindle his passion for writing again and produce something he can sell the movie studios. Stone is a cynical character and he doesn’t have any real hope his exile getaway will produce anything positive. Rather he believes he’ll simply disappear off the face of the globe and no one will give a damn. Which is exactly what seems to be happening until a wrong turn on a lonely country road brings him to Sheepheaven Farm and Maggie Barlow. Maggie is an earthy woman, wife and mother, also trapped in a life she abhors. Her husband, Robbie, is a sheep farmer barely making ends meet, which is why they rent out the spare bedroom as a Bed & Breakfast operation. Their ten year old son, Terry, is a precocious lad that Jack takes to immediately. What he doesn’t foresee is how he easily he becomes obsessed with Maggie. Maggie is a forceful, sexual creature that soon poisons Jack’s every waking second until he is obsessed with her like the tide with the shore. In classic noir fiction, people get sucked into dark deeds almost as if against their will. The passions of the heart overrule the intellect until they are lost in a maze of evil. Jack Stone is a good man who finds himself in love with another man’s wife and will do anything to possess her. He is quickly ensnared in a deadly spider’s web of his own making. Russell Hill writes deceptively simple first person prose that is froth with psychological complexities. All the while I was reading this book, I kept hoping that Jack would come to his senses and escape his doomed fate. The suspense never lessened until the very last page where the finale is a bitter, honest revelation. 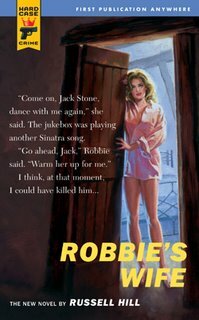 This book is a terrific crime thriller destined to become a classic in the genre. They just don’t get any better than this. Recently there has been a lot of good press concerning the publication of Paul Malmont’s book, THE CHINA DEATH CLOUD PERIL. It seems that all of pulp fandom has been enamored by this fictional account whereby writers Walter Gibson and Lester Dent experience a real adventure vis-à-vis those they created paper. I was one of those reader/critics who loved that book and recommended it to all my pulp loving friends. Well, I’m here today to showcase another book that does the same thing as Malmont’s effort and just as well. Unfortunately this one did not have the luxury of a being a hardcover or getting a marketing blitz to make P.T.Barnum envious as the other did. Which is the real crime here and one I hope to help correct. 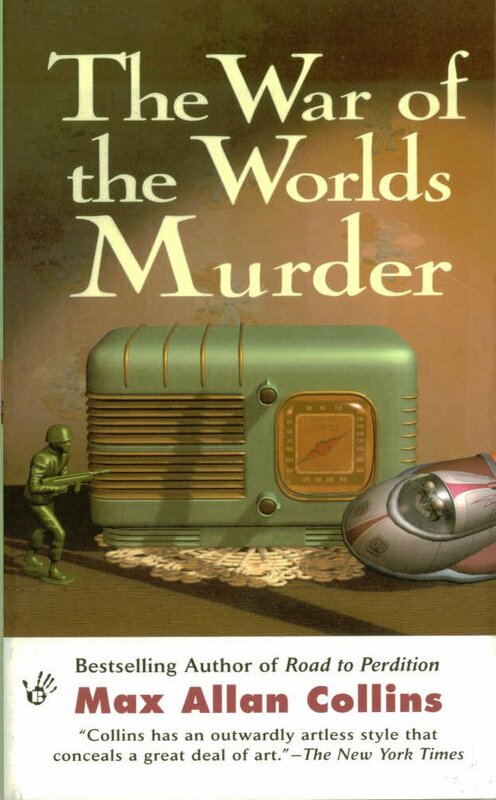 THE WAR OF THE WORLDS MURDER is one in a series of murder mysteries set against the backdrop of an historical disaster; all written by the master of this genre, Max Allan Collins. Previous titles in the series were THE TITANTIC MURDERS, THE HINDENBERG MURDERS and THE PEARL HARBOR MURDERS to name a few. Now the twist with this particular entry is it tells the story of the most famous bogus disaster of them all, the 1938 War of the Worlds radio program devised by Orson Welles and his Mercury Theater of Air for CBS. Martian invasion tale as if it were real and they were news broadcasters bringing the horrifying details to the public. By altering Wells story to a modern setting, the Martians landed in a farm field in New Jersey, the inventive Welles and his crew were able to convince thousands of listeners that we were actually under attack. Hundreds of families packed their kids and belongings into their cars and headed north with all possible speed, clogging up major roadways leading to and from the New Jersey area detailed in the bogus reports. To be fair, Welles had read a disclaimer explaning the dramatization at the start of the program, but the those people who tuned in late were not privy to that announcement and believed every terrorizing word they heard that night. That this mass hysteria did not cause a single loss of life was nothing short of a miracle. Once the hoax was revealed, the authorities clamored for Welles’ head on a pike, but after a few days, the furor slowly died down and people began to appreciate the dark humor that had so thoroughly tricked them. Halloween and immediately gets caught up in the War of the Worlds presentation. Collins has fun with Gibson and sketches the writer/magician expertly. He’s clearly a fish-out-water around Welles and his troop of actors, but relishes being among them like a kid in a candy store. He is unaware his role is about to change dramatically. An hour before the show is to go on the air, a missing young woman, the studio’s receptionist, is found murdered in an empty broadcast room, her throat cut. The weapon by her body, a keen edged blade, belongs to Welles. Shocked by the discovery, Welles turns to the famous mystery writer and pleads with him to solve the murder and clear his name. Thus, as the Welles sets about scaring the wits out of America, Walter Gibson goes on a hunt for a killer who may still be roaming the cavernous halls of the Columbia Broadcasting building. THE WAR OF THE WORLDS MURDER is just as much fun as THE CHINA DEATH CLOUD MYSTERY and actual trumps it in one important detail, the main plot background is real and actually happened as described. Whereas most of Malmont’s book is pure fabrication. If you are one of those many people who picked up Malmont’s book, then do yourself a big favor and find THE WAR OF THE WORLDS MURDER. It’s like visiting an old neighborhood again, one where you always had a rollicking good time. Perhaps no single science fiction franchise has spawned as many books as Paramount's STAR TREK, based on the 60s television show created by the late Gene Roddenberry. Now I don't presume to know how many of these books based on that original series and the its four subsequent sequels have been released. I know I've read lots of them, most of which were from STAR TREK THE NEXT GENERATION, my personal favorite of all the incarnations of Roddenberry's dream of "the final frontier." By far the most popular series of all the Pocket Book Star Trek is not based on any of those television shows or the feature films they launched. 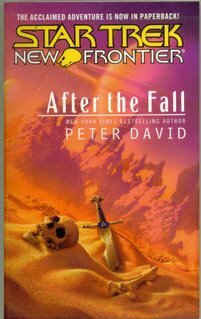 Rather, the most amazing, original, and thoroughly satisfying adventures based on the Star Trek franchise are those invented by writer Peter David and aptly called New Frontier. The New Frontier books, of which AFTER THE FALL, is the 18th, center around the Federation Starship Excalibur as helmed by Captain McKenzie Calhoun, a one-time junior warlord, savior of his planet and protege to Captain Jean Luc Picard. McKenzie and his bizarre, fascinating and always intriguing alien crew are the most realized characters ever to populate the Star Trek universe. From the rock-humanoid Kebron to Burgoyne, who is a half-female/half-male Hermat. I won't ever try to explain that; read the books. David has filled his crew with the supporting players from the various TV shows, to even include a couple from the short lived animated Star Trek series, mixing them beautifully with his own creations. Having said all that, I do have to add that the books do not stand alone all that well. Each is a continuing chapter in an ongoing saga. 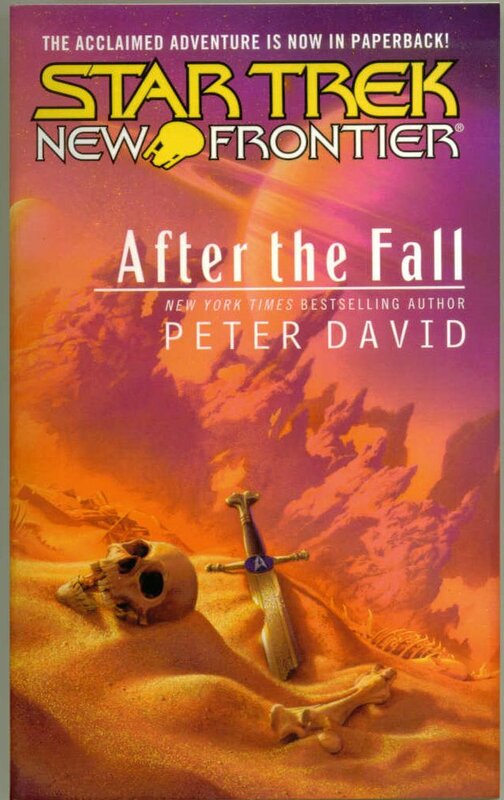 So, although AFTER THE FALL, is a terrific read, unless you've read the previous books, you are going to be completely lost as to who these people are and what they are about. Still, if you like fast paced, absolutely unique and powerful characters, then I would urge you to make the effort; find those early books and jump on board. It's one hell of a fun ride. One Roddenberry would have truly appreciated.